Known around the world for its strip of powdery white sand, where luxurious hotels and nightclubs face incredibly turquoise waters, Cancun’s beaches are located on a narrow sand bar across from the city proper. Last week, the “Zona Hotelera” (Hotel District) bulged with Spring Break revellers from the U.S. and Canada, as well as other countries. The pulsating beat of hip hop and pop music could be heard over the strong Caribbean trade winds buffeting the shore. The cool ocean breezes also reach the other side of the bay, parallel to the hotel zone, along the Malecón Tajamar. A “malecón” is a typically Latin waterfront promenade, and “tajamar” means “breakwater.” It is a favoured place in the early evening for Cancun residents to jog, walk their dogs, play with their kids and snuggle with loved ones. Tuesday nights have yoga class, Sunday evenings a youth group rehearses salsa dancing. As night falls, the twinkling lights of the distant hotel zone look like constellations of stars pulled down from the sky. The cool air and 150 acres of space behind it provide a respite from the hot, mostly concrete and increasingly congested city. Until January 16, a dense mangrove forest led up to the malecón, separating the peaceful walkway from the bustling city. But at 2am on that Sunday, bulldozers moved in and tore the mangrove trees away, destroying a much needed natural greenspace for residents, and demolishing the habitat of thousands of creatures. The residents of Cancun reacted, and moved to protect and restore what was left of the forest. 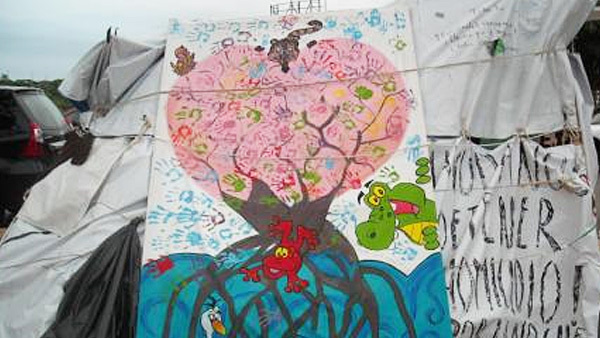 Every day and night since January 16, the Guardianes del Manglar (Mangrove Guardians) stand vigil under a blue and white tent, next to a painted tarp depicting a large mangrove tree embracing the earth with its extensive root system. They are there to protect what’s left of the lush mangrove forest that used to provide a buffer between the waterfront and the city, and save it from further destruction by the government on behalf of developers. The mangrove was home to many living creatures, including the enormous crocodiles that delight residents and figure so prominently in historical Mayan cosmology. In the darkness before dawn on January 16, bulldozers entered the area supposedly protected under Mexican law, ripping out the rare white mangrove trees and destroying the habitat of thousands of creatures. Many dismembered crocodile carcasses were on view in the days and weeks after, while other animals were ploughed under and buried alive by the heavy machinery. The destruction was carried out under the supervision of the Mexican government tourist agency (the National Fund for Tourism Development, Fonatur), with federal police on hand to protect the operation. As one of the only greenspaces for Cancun residents, the loss of Tajamar Mangrove was felt immediately, and civic reaction was swift. It was young people who spearheaded the campaign to take immediate legal action to stop the developers. Citing Mexican law as well as international legislation which strictly control mangrove forests, citizens and youth groups were able to convince a judge to stop the destruction within four days. By January 20, a court had issued an injunction against further development, the Guardians moved in, and fences were installed. At first the fences were covered with black plastic sheets, but activists tore them down to better survey the area and ensure its protection. Mangroves protect and extend the shoreline. In an area prone to hurricanes such as Cancun, which was devastated by Hurricanes Gilbert in 1988 and Wilma in 2005, the loss of the mangrove forests is a serious issue. Every last one remaining is essential. “They came at dawn on a Sunday when no one was there,” added Yolanda. “I collected many signatures to present to the court,” said Patrícia. Indeed, thanks to the Guardians, activists, youth groups and citizens, the area is being protected and allowed to recover. A snowy egret was spotted from the path that used to cut through the lush forest, taking careful steps in the muddy pools and alternately extending its neck upwards and down into the water. A few bright yellow and red birds flitted inside the wire enclosure, and a frightened grey and black iguana with a broken tail quickly jumped down a drainage sewer when approached.